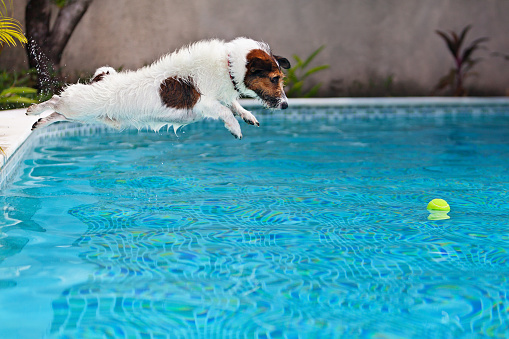 A question that is sometimes asked by residential pool owners is if pets should be allowed to swim in the pool. Since a pet is often a family member and pools are for family gatherings, should pets be allowed in the swimming area? Here are some thoughts from Pool Troopers on whether pets in the pool are a good or bad idea. Some dogs such as labs, retrievers and spaniels are breeds that have been known to hunt in the water, so it is like their home. Water is a great source of exercise for a dog if they take to it. Kids love to share the water with their pets; however, you should keep in mind a few things. It is believed, however, that most water-borne illness is transmitted by people. If your dog shows any symptoms of illness, they should not be allowed in the pool. Children should also be taught to avoid ingesting pool water. As far as your filter system goes, a dog in the pool is equal to approximately 50 people and will make the system work harder. 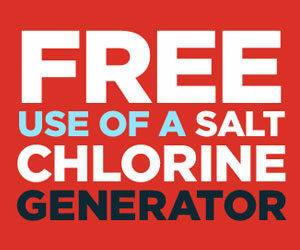 In addition to this, pets in the pool will raise the pH, and chlorine will get consumed faster. Pool Troopers can help you make sure that your pool is disinfected and safe for family members as well as pets. The chlorine in the water may be a slight problem for dogs. According to the American Kennel Club, “A dog’s eyes, nose, and ears are more sensitive than a human’s and as such may be a tad more susceptible to the effects of chlorine.” Dogs, like people, should be hosed off or showered after being in a pool. Your dog can also get red eyes and irritation, just like its human owners. Read more about pets in pools here. Cats generally are not in favor of being in the pool. In the case that they do enter the water, a ramp that is specifically designed for pets or cats is important (as well as supervision). Cats can also get heat stroke and hyperthermia and should be monitored for lethargy, weakness, drooling or difficulty breathing. You should never assume that your cat knows how to swim – introduce him or her into the pool slowly, and do not let the cat drink the pool water. Read this for more safety tips for cats in the pool. Like children, pets should not be left alone in a pool. If something happens, they may panic and can drown. Keep a consistent watch on pets and children at all times. Make sure you check the pool regularly, especially if pets swim in it, to ensure that the water remains healthy for all. 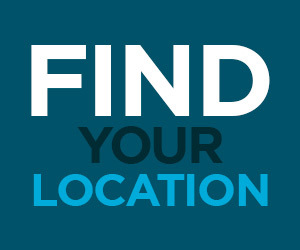 Pool Troopers, with thousands of satisfied clients since 1952, can help you with the maintenance of your pool. Cloudiness in the water means steps need to be taken. 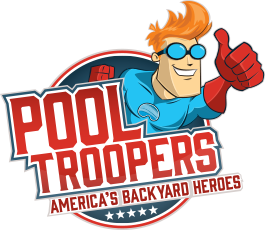 Let Pool Troopers help you keep an environment in which it is safe for both family and pets to swim.